Just a short announcement today. For our art contest at CelebratingArt.com, we are pleased to announce that Blick Art Materials is now providing our awards. This is a great sponsorship from a nationally recognized company, as we provide awards that help our teachers and students further their art. It is also a great endorsement for our company. We have never pursued sponsorship before and are excited about the possibilities. We thank all the teachers and students that believe in our mission of motivating and recording student work. Having Blick Art Materials believe in us helps give us additional credibility. As we pursue other endorsements from educational organizations for our writing and art contests, let us know if you have any ideas or connections. Our contests have changed thousands of lives as students believe in themselves and become life long writers and artists. What we do is important and we are glad to be here for you. I just got off the phone with a father thanking me for publishing his daughter several years ago. We often have calls such as this, but this one was different. He told the story that it was our contest and the recognition that it gave in making his daughter a published writer that really gave her the confidence to excel. We also hear that often. However, his daughter, 15 year old Meredith Graf, has gone beyond the normal high school accomplishments to national recognition. To understand the prodigy that she is you can read more here. 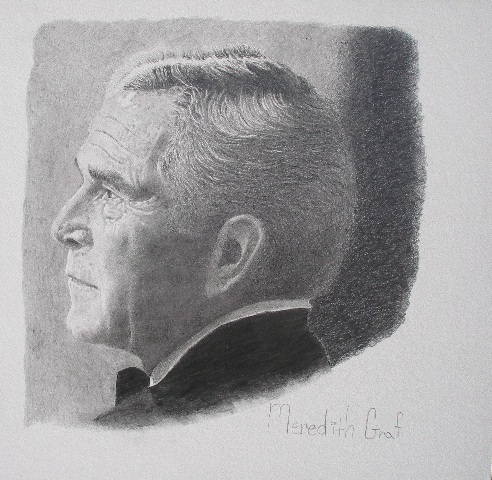 In our art contest, due to her gift as an exceptional artist, Meredith has made an ethical decision to not enter. However, her father related that she wants to give back to Creative Communication, the sister company to CelebratingArt.com, by designing a book cover for us. The pictures below are Hall of Fame basketball player Bill Russell and a portrait of President Bush that is on display in his residence. We love it when we hear the stories behind the contest entry. It humanizes the words and the art and helps us see the student who did the work. One teacher, several years ago, offered our contest to his or her students. The result was a confident young women who is changing her world and the world around her. Thank you to that teacher for giving the students this opportunity. 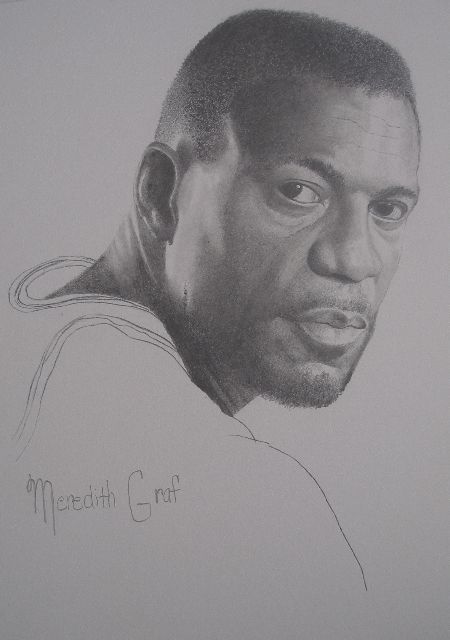 Thank you Meredith for sharing your work. We hope that more teachers will use our contests to give students the confidence to know that they can succeed. 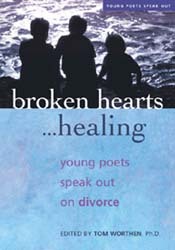 Ten years ago, after I had been divorced for several years, I published a book called Broken Hearts….Healing: Young Poets Speak Out on Divorce. It was a compilation of kids from across the US who wrote on their feelings and the stages they went through from a divorce. It was written by the real experts, the kids, and received a couple of national awards. Yesterday we published the ebook version at smashwords.com. In doing this I reflected back to what made me create and publish a book. After my divorce, my kids would come home and tell me that they were the only kids in their school that come from a divorce family. In reality, about half of their classmates were in this group. The book was created to help them realize that they were not alone. However, publishing the book was more than the content of what was created. It was a project completed. How many of us have large goals that stay as good intentions. Something we think about and don’t follow through to completion. When I received my Ph.D., one of my professors stated that there are thousands of students every year that start a graduate program, often they finish the classwork, but end up ABD (All But Dissertation) and never receive their Ph.D. Aside from the big things in life like creating a book or getting a degree, how many small things do we need to cross off our list? Small things that we could accomplish, yet don’t, due to our just not doing them. I look back at things I have done for my students in the classroom, for the students we work with in the contests, my family and personal areas of my life. When I take a task and finish it, looking back makes me proud of myself. I feel more confident. It feels good. For the students we work with in the contests, we have hundreds of letters stating that becoming a published writer or artist became an event in their lives that is an accomplishment. Taking the time to create and finish a task, at any level, is something we can all do. Look around at the various parts of your life. What can you finish? What can you help your students finish? For me, 10 years ago it was a book that is now used by school counselors across the US. Something I did hopefully made a difference in some child or parent’s life. However, I do know that completing a goal had made a difference in my life. Bite off more than you can chew and chew it. Do more than you can do and do it. I think it was attributed to Tennessee Ernie Ford. For the last 45 years, that has been a motto that I have lived by. But I realize that there are pros and cons to this lifestyle. As a student and a teacher, I have always been an overachiever. I have bit off more than I could chew, and to my surprise I always chewed it. I excelled and became a teacher who has received teaching awards at two universities, had my speech and debate teams win national awards, has given service on many boards, and has given a lot back to the community. It was more than I thought I could do. But getting to that star is a process and not a goal you reach. There is always more to do. More to achieve. Perfection is something to work toward, not to obtain. Once you have taken on the attitude of always doing more, you can never take a seat and arrive. As a teacher, I have found that I can always do more. But then there is a cost. Time away from family, less sleep, a few more gray hairs. This year I am in charge of my 35th high school reunion. In contacting my classmates, I find a few obituaries along the way. I stop and wonder what the costs were along the way of doing too much. We alway hear to “Stop and smell the roses.” Maybe taking in a little from both mottos will create a better balance. Just a few thoughts for the day. Make your day an awesome one! Ten years ago, I went to California to spend the weekend with my 98 year old grandmother. She was a sculptress that has work in several museums around the country and worked with Gutzon Borglum (who did Mt Rushmore) . We we wanted to go to her studio and make castings of some of her best work. What I did any other weekend that year I can’t tell you. But that weekend became an event that I will remember the rest of my life. She lived to 103 and is now gone. Each day we have the opportunity to do things that are memorable. The last sitcom I watched on TV was Seinfeld in the 1980’s. Yes, I am culturally illiterate about the latest celebrity. But instead of that time watching TV, I have done a hundred projects with my kids and hopefully made the world a better place. With our art and writing contests, there are a million kids who will NOT enter the spring contest. There will be several thousand that will enter. These students took a risk and will send in a bit of themselves through their art, poetry or essay. Henri Matisse said, “Creativity takes courage.” The students who do NOT enter will have no benefit from playing it safe. The students who Do have the courage to enter may not move on in the competition or be accepted to enter, but they won’t know unless they try. However, the students that are accepted to be published or are a top ten winner, will have taken a risk that will give them a reward they will remember the rest of their life. This weekend, do something that you will make it a memorable weekend. That is my challenge. Make it a weekend, like I did ten years ago, that I now look back and remember. Those are the days that we cherish and the opportunities that are rewarded.